As I recently said in another blog post, the World Cup Football is such a wonderful source of data that begs to be digested using SQL in many different ways. While working on a tag cloud producer – topic for a subsequent article – I ran into a special challenge. It is easy to describe, yet not so easy to resolve. Or at least, it took me some time to come up with this approach. I would like to invite any reader who has a suggestion as to how this can be resolved. For my tag cloud regarding the matches in the World Cup tournament, I want to identify those matches that has a comeback in them. That is: matches where the winner has comeback from trailing the opponent . For example: The Netherland were 0-1 behind against Spain (after the penalty kick) and went on to win the game. So this match Spain-The Netherlands has a comeback. I have made use of a compact notation of the way the scoring process went, using a string with 0 and 1 characters. For example: ‘011111’ describes the Spain-Netherlands match. The zero indicates a goal for the home team (Spain), each 1 represents 1 goal for the visitors (The Netherlands). ‘1000’ is the scoring process in Brazil vs Croatia – with Croatia coming into the lead before conceding the match. To find the matches with a comeback in them, I have to find the strings that somewhere midway have more ones than zeros but in the end have more zeros than ones – or vice versa. with the Spain-Netherlands match highlighted. It reads_ match number 3, group B, number 1 in the group playing at home vs the number two in the group playing away. The next step calculates the running_score: the difference between the number of home and away goals – using the translate operator that replaces every occurrence in the source string of the indicated character with its indicated replacement. When no replacement is specified for a character, it is simply not included in the resulting string. 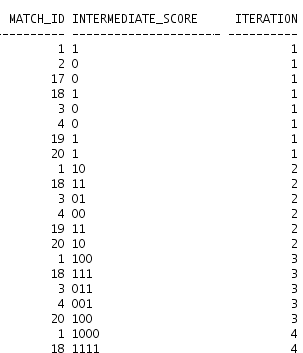 Note: the leading ‘0’ and ‘1’ are added because length(translate(‘000’,’10’, ‘1’)) results in NULL. I could have used NVL instead of adding the extra character. 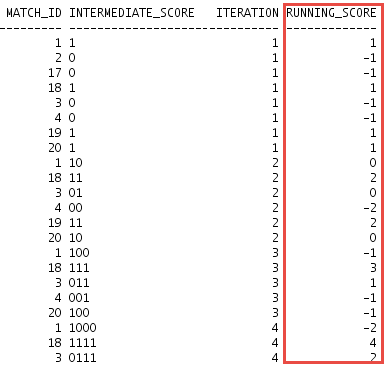 To find the matches with a true comeback in them, I need to identify the match_id’s that at one point in time had a negative running_score and at some other moment a positive running_score. 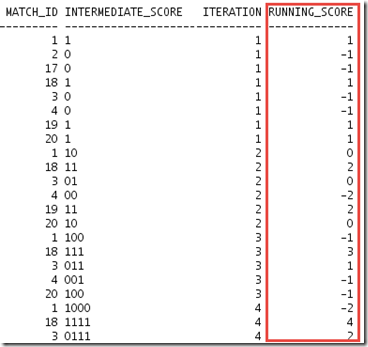 Using simple aggregating (MAX and MIN) along with HAVING I can find the match_id that have running_scores on opposite sides of zero. The next level of challenge would be to find ‘dramatic comebacks’ where a team was two goals behind at some stage and yet managed to win the game. Any suggestions for resolving that one? The first thing I do is find out who won. If there are more ‘1’ than ‘0’, the winner is 1. If there are more ‘0’ than ‘1’, I call the winner -1. If they are equal it was a draw and I throw out that match. 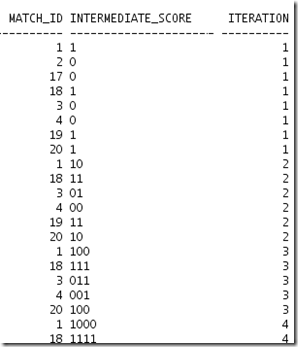 To get the comebacks, within scoring_process I translate ‘1’ to 1 and ‘0’ to -1 and I take a running sum. I then take the maximum of that running sum, adjusting the sign depending on who the winner was, and that tells me how far behind the winner got before coming back. If the winner was never behind, I throw out that match. These query also list matches with a comeback, but which result in a draw.